INDIANAPOLIS -- Indiana University-Purdue University Indianapolis has been named to the 2013 President’s Higher Education Community Service Honor Roll. This designation is the highest honor a college or university can receive for its commitment to volunteering, service learning and civic engagement. 209 service-based scholarships were awarded to students resulting in 47,594 hours of community service, equivalent to $1.03 million. 9,955 students were enrolled in service learning courses, providing more than 181,262 hours of service to 278 community partners. Over 2,893 students, faculty and staff were involved in campus-wide volunteer service events contributing over 10,475 hours of service. Nearly 35 percent of all study abroad courses offered at IUPUI have an integrated service component. Inspired by the thousands of college students who traveled across the country to support relief efforts along the Gulf Coast after Hurricane Katrina, CNCS has administered the award since 2006 and manages the program in collaboration with the U.S. Department of Education and the U.S. Department of Housing and Urban Development, as well as the American Council on Education and Campus Compact. The President's Higher Education Community Service Honor Roll honors the nation’s leading higher education institutions and their students, faculty and staff for their commitment to bettering their communities through service. These are institutions that reflect the values of exemplary community service and achieve meaningful outcomes in their communities. The Corporation for National and Community Service (CNCS) is a federal agency that engages more than five million Americans in service through Senior Corps, AmeriCorps, the Social Innovation Fund and other programs, and leads President Obama’s national call to service initiative, United We Serve. 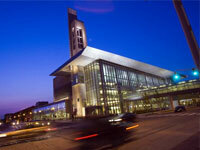 IUPUI is Indiana's premier urban research university. The campus enrolls more than 30,000 students in 21 schools and academic units.